A friend of ours (thanks Elaine!) has sent us the floor plans for CUBE 8 last month. Thinking that the wife and I will get to this project in good time, it did not occur to us to put the floor plans on our blog until we get the chance to review the development. However, it has been a case of “too many new projects, too little time” for us. And our recent attempt to visit the sales gallery of CUBE 8 was unsuccessful as it was closed – we are not sure if they are just closed for the CNY period or are now on a “view by appointment" basis, since we understand that more than 167 of the 177 units in this project are already sold. And in the spirit of "better late than never", here are the floor plans for CUBE 8. For the uninitiated, and those who just returned from Mars, CUBE 8 is possibly THE hottest selling project when it was launched in January this year. This freehold project developed by City Developments Limited is on Thomson Road (almost right next to the Thomson Road/Balestier Road junction) on the site of the former The Albany and Thomason Mansion. 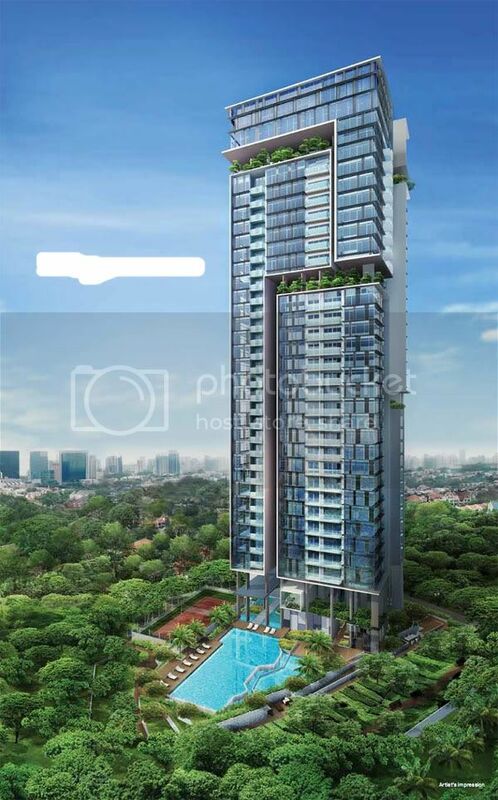 It is located next to The Arte (another CDL project) at Thomson, which was launched for sale in March last year. While the two projects are adjacent, The Arte is in District 12 wile CUBE 8 is in District 11. The 36-storey CUBE 8 has 177 apartments, comprising 39 one-bedroom units, 58 two-bedders, 67 three-bedders, 9 four-bedroom apartments and 4 sky villas (2-level penthouses). Just going by the floor plans alone, we quite like most of the unit layouts although there should be a powder room provided in the 4-bedroom unit (in an ideal world at least). The location of CUBE 8 is also quite central and well served by the nearby PIE/CTE. It is also within 15 – 20 minutes drive of Orchard and CBD under normal traffic conditions. But the constant heavy traffic along Thomson and Newton Road (especially the stretch just in front of Novena church), not to mention Lornie Road during the morning/evening rush hours, may put paid to any desire to get anywhere fast. The wife and I can probably deal with the traffic. But what concerns us most is the fact that CUBE 8 is located way too close to comfort to a certain old condo that is supposedly…now how shall we put this gently…resided by not just human occupants and their pets. So it is probably the main reason why we will give this project a miss. The average transacted price for CUBE 8 in January was reportedly around $1250psf, valuing the three-bedroom units at $1.6 - $1.8million, while the four-bedders cost around $2.5million. The sky villas will set you back by $3.6 - $3.8million. But we reckon the prices would have increased, probably by more than once, by now. 2 comments to ''CUBE 8 Floor Plans... if it is not too late!" But what concerns us most is the fact that CUBE 8 is located way too close to comfort to a certain old condo that is supposedly…now how shall we put this gently…resided by not just human occupants and their pets. So it is probably the main reason why we will give this project a miss.